I know you’re all waiting to hear about last Saturday’s sacrament party; did the weather cooperate? Did all 120 people show up? Did our septic system hold out???? Okay, so humor me anyway. In an unexpected twist, thanks to a forecast that called for 50 percent or greater chance of rain all day Saturday, we made the last-minute decision to move the party to our church’s hall. I spent all of last Friday calling and messaging everyone I knew to make sure they wouldn’t show up at my house. We also had to adjust our time so our rowdy party wouldn’t disrupt the Saturday vigil Mass. Thankfully, the majority of families were still able to attend for a total of 105 people. The weather held out too, and the kids got to run around outside, though they were under strict orders from our parish priest to not drag mud into the hall, which I viciously enforced because I’m cool with being the bad guy out of gratitude. It was a fun time during which I took pretty much zero photos, except of the roast pig and my sweet cake decorating skills. For the next party, I plan to whip up a Cookie Puss and Fudgy the Whale. And that’s totally a flame, not the head of Satan, on Addie’s cake. 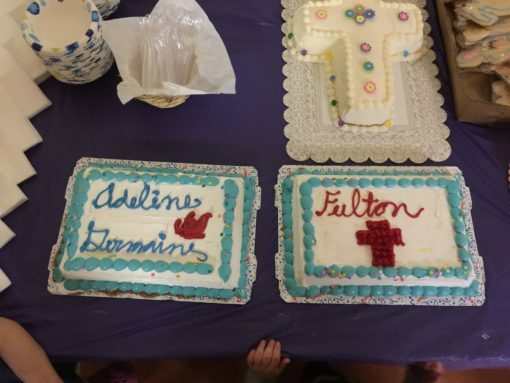 Congrats to Fulton and Addie! Sometime though you really need to do a 7QT on how you throw a party for 120 in your yard. The specifics,like food, drinks, entertainment, and availability of a bathroom. Most importantly though, how you do it without losing your mind! I’m throwing a graduation/First Communion party next weekend with maybe 50 invited and I am stressed!!!!! 1.First, I completely expect to lose my mind! Trying to hold onto those last strings of sanity will only make you crazier. My kids will be the first to confirm that Mama was more high-strung these last few weeks in preparation for ALL THE MILESTONES and accompanying celebrations. I’m still trying to catch up on all the “business as usual” that didn’t get done amidst the planing/painting, but I’m finally exhaling, not stressing and getting reprimanded less from the kids on my language. So insanity is normal and to be expected when hosting anyone outside your immediate family. 3. Liquidate your kids college fund, cause yo, food is expensive! And people always show up at a party expecting to eat and drink; like your puns and tap water aren’t good enough. For our summer party, we provide burgers and dogs (with buns), watermelon, ice tea, lemonade, smores fixings, some alcohol and lots of paper goods. Everyone else brings the sides, desserts and more alcohol. We’ve had years with lots of leftover food and drinks and other years when it seemed like just enough. Even to Saturday’s Sacrament party, which we fully intended to provide all the food for, most folks were kind enough to bring a side dish or drink. Maybe it’s just the community of people I’m a part of, but we always get offers for food whenever we entertain, and we try to always return the favor. My extended family is the same way so, thankfully, despite the numbers of people, we still have money to send some of the kids off to college. But it helps to budget for large events, which we do since it’s a yearly expense and sacraments are pretty predictable. 6. I don’t plan many activities. 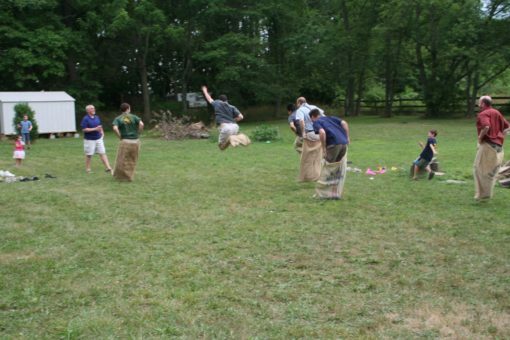 We have an annual sack race and a bonfire; only one comes with bragging rights. The few times we’ve set out yard games whatever it is soon becomes a weapon in a battle and is broken or lost. I’m still finding pieces from that croquet set. I have a friend who always offers to bring water balloons or sponges and buckets for a wet sponge fight and we usually take him up on that. Otherwise, adults talk, kids run and play. We do have a tree fort and swing set. When we had a working trampoline and pool and I closed them both because I didn’t feel like policing them the entire time. We don’t plan anything for Sacrament parties. Thus far, boredom has never been an issue. I am not kidding when I say people throw themselves whole hog into the sack race. 7. Lastly, hosting lots of people in or out of your house, or somewhere else, is stressful and requires a bit of planning and hard work, however, I find that hospitality is almost always worth it. If problems arise the day of the party (once we ran out of cups within an hour)I just try to keep a sense of humor and improvise. I don’t expect everything to be perfect, so when it’s not (child goes missing only to be found hiding in the back of his family’s van) I don’t freak out about it (and cheerfully offer a drink to anyone who is). And you certainly don’t need to host 100 people. Start by inviting a couple of families, and go from there. Our group of friends tends to organize parties around major feast days too, so it’s a great way to celebrate the liturgical year in community. Let me know if you’re inspired to host a large party or break into your neighbor’s house! Invite me! I’m a blast at parties and I’m small enough to slip in through an unlocked basement window! Who else has Sacrament joy to share? Write it down then link it up below. 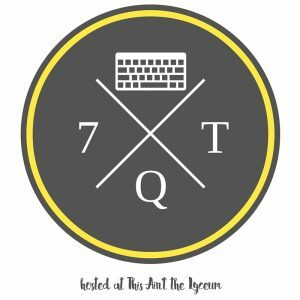 Be sure to include a link back to this post so your readers can find the rest of the Quick Takes. I look forward to reading your posts! “child goes missing only to be found hiding in the back of his family’s van” HAHAHA!!! I totally forgot that happened. Good times. So glad you’re blogging MY memories, too. Yay for the church hall saving the day! That sounds like a super fun party. The “breaking and enter-taining” thing made me laugh 🙂 I agree on the “don’t plan out bunches of activities” thing. Kids really do know how to entertain themselves when you let them loose together. Wow to you! I hate entertaining, it’s a complete nightmare for me. Good thing we’re hermits, mostly.